New app. New logo. Sharpened focus. Slacker Radio has joined the year-end rush of music service upgrades (Rhapsody, YouTube Music Key, Shazam, Musx, Tidal) with a new iOS app that doubles down on Slacker’s signature hosted playlists. Slacker has always been strong in the hosted playlist department. In a conversation with RAIN News early this year, SVP of Strategic Development and Content Programming Jack Isquith told us how Slacker emphasized human-powered programming: “We focus our programming team on three C’s: Curation, Community, and Context. We discuss these in every programming meeting. We’re making a big bet that you really need hosts and the human voice, the sense of humanity actually in the listening product.” He noted that curated stations outperformed non-hosted playlists by three to one. In the updated iOS app, new humanized playlists are helpfully surfaced on a new TODAY ON SLACKER screen. 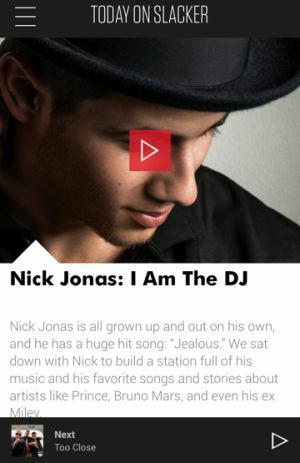 We listened to the “Nick Jonas: I Am The DJ” station, which presented Jonas’ favorite tracks interspersed with his commentary and intros. Entertainingly, short segments in which Jonas answers rapid-fire “What is the best (whatever)” questions (e.g. What is the best dog name? Elvis) came up from time to time. We found 26 so-called artist takeovers — e.g. the “I Am The DJ” stations. YouTube personalities Tyler Oakley and comicbookgirl19 are on board. On the design side, Slacker’s iOS upgrades are substantial and attractive to our eyes. The new logo puts the classic-rock biker emblem in the past, where it retires as an honored symbol of Slacker’s pioneering spirit. The app’s user design is clean as a spring morning, and re-balances what Slacker wants us to see and hear. You can still find the day/mood stations and the in-house genre stations, but those experiences no longer take the lead. The TODAY ON SLACKER page now opens the app, funneling users to what Slacker wholeheartedly regards as its premium programming. Slacker’s marketing emphasizes the content changes more than cosmetic changes, but the design re-think is deep, and the re-branding is significant. It’s going to take a while for us to stop looking for the legacy orange app logo … but we expect to spend a lot of time in the new Slacker experience.